Kepler-7 is a star located in the constellation Lyra in the field of view of the Kepler Mission, a NASA operation in search of Earth-like planets. It is home to the fourth of the first five planets that Kepler discovered; this planet, a Jupiter-size gas giant named Kepler-7b, is as light as styrofoam. The star itself is more massive than the Sun, and is nearly twice the Sun's radius. It is also slightly metal-rich, a major factor in the formation of planetary systems. Kepler-7's planet was presented on January 4, 2010 at a meeting of the American Astronomical Society. Kepler-7 received its name because it was the home to the seventh planetary system discovered by the NASA-led Kepler Mission, a project aimed at detecting terrestrial planets that transit, or pass in front of, their host stars as seen from Earth. The planet orbiting Kepler-7 was the fourth planet to be discovered by the Kepler spacecraft; the first three planets combed from Kepler's data had been previously discovered, and were used to verify the accuracy of Kepler's measurements. Kepler-7b was announced to the public on January 4, 2010 at the 215th meeting of the American Astronomical Society in Washington, D.C. along with Kepler-4b, Kepler-5b, Kepler-6b, and Kepler-8b. Kepler-7b was noted for its unusually and extremely low density. The planet's initial discovery by Kepler was verified by additional observations made at observatories in Hawaii, Texas, Arizona, California, and the Canary Islands. Kepler-7 is a sunlike star that is 1.347 Msun and 1.843 Rsun. This means that the star is about 35% more massive and 84% wider than the Sun. The star is estimated to be 3.5 (± 1) billion years old. It is also estimated to have a metallicity of [Fe/H] = 0.11 (± 0.03), meaning that Kepler-7 is approximately 30% more metal-rich than the Sun; metallicity plays a significant role in the formation of planetary systems, as metal-rich stars tend to be more likely to have planets in orbit. 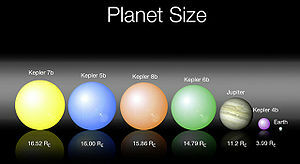 The star's effective temperature is 5933 (± 44) K. In comparison, the 4.6 billion-year-old Sun releases less heat, with an effective temperature of 5778 K.
A picture showing the relative sizes of the first five planets discovered by Kepler. Kepler-7b is the largest, highlighted in yellow. The star has an apparent magnitude of 13, meaning that it is extremely dim as seen from Earth. It cannot be seen with the naked eye. It is estimated to lie at approximately 3090 light years from the Solar System. There is a star that is 4 magnitudes dimmer located 1.90 arcseconds away, whether this a gravitationally bound companion star or a chance optical alignment is unknown. Kepler-7b is the only planet that has been discovered in Kepler-7's orbit. It is .433 MJ and 1.478 RJ, meaning it is 43% the mass of planet Jupiter, but is nearly three halves its size. With a density of .166 grams/cc, the planet is approximately 17% the density of water. This is comparable to styrofoam. At a distance of .06224 AU from its host star, Kepler-7b completes an orbit around Kepler-7 every 4.8855 days. Planet Mercury, however, orbits the Sun at .3871 AU, and takes approximately 87.97 days to complete one orbit. Kepler-7b's eccentricity is assumed to be 0, which would give Kepler-7b a circular orbit by definition. ^ a b "Kepler-7". SIMBAD. Centre de données astronomiques de Strasbourg. Retrieved 2018-11-24. ^ a b Latham, David W.; et al. (2010). "Kepler-7b: A Transiting Planet with Unusually Low Density". The Astrophysical Journal. 713 (2): L140–L144. arXiv:1001.0190. Bibcode:2010ApJ...713L.140L. doi:10.1088/2041-8205/713/2/L140. ^ a b c Rich Talcott (5 January 2010). "215th AAS meeting update: Kepler discoveries the talk of the town". Astronomy.com. Astronomy magazine. Retrieved 27 February 2011. ^ Johnson, Michele, ed. (2018-10-30). "Mission overview". www.nasa.gov. NASA. Retrieved 2018-11-24. ^ a b c d e f "Summary Table of Kepler Discoveries". NASA. 2010-01-04. Retrieved 2010-01-06. ^ "NASA's Kepler Space Telescope Discovers its FIrst Five Exoplanets". NASA. 4 January 2010. Retrieved 27 February 2011. ^ Henry Bortman (12 October 2004). "Extrasolar Planets: A Matter of Metallicity". Space Daily. Retrieved 27 February 2011. ^ "Notes for star Kepler-7". Extrasolar Planets Encyclopaedia. 2010. Archived from the original on 21 January 2011. Retrieved 27 February 2011. ^ Fraser Cain (16 September 2008). "How Old is the Sun?". Universe Today. Retrieved 27 February 2011. ^ David Williams (1 September 2004). "Sun Fact Sheet". Goddard Space Flight Center. NASA. Retrieved 27 February 2011. ^ Hirsch, Lea A.; et al. (2017). "Assessing the Effect of Stellar Companions from High-resolution Imaging of Kepler Objects of Interest". The Astronomical Journal. 153 (3). 117. arXiv:1701.06577. Bibcode:2017AJ....153..117H. doi:10.3847/1538-3881/153/3/117. ^ David Williams (17 November 2010). "Mercury Fact Sheet". Goddard Space Flight Center. NASA. Retrieved 27 February 2011. Boyle, Alan. "How astronomers mapped the patchy clouds of an alien world". NBC News. Retrieved 3 October 2013. This page was last edited on 25 November 2018, at 16:52 (UTC).